Title: TURKEY TAKES ABRUPT TURN TO MILITANT ISLAM IN ELECTIONS JUST CONCLUDED! ARE WE WITNESSING EZEKIEL 38-39 (RUSSIAN LED INVASION OF ISRAEL) PROPHECY BEING FULFILLED IN OUR DAILY NEWS? Subtitle: Radical Islam scored "landslide victory" at the polls on Sunday, 11/3. Immediately, Turkish leaders issued a statement opposing U.S. attack on Iraq unless U.N. approves. Turkey is prophesied to march with Russia on her invasion of Israel; we have been awaiting the government change from pro-Western to radical Islam for years. Is this that change? NEWS BRIEF: "Turkish party with Islamic roots wins in landslide", by Herb Kineon, The Jerusalem Post, Nov 4, 2002. "ANKARA -- Turkey's voters gave a resounding victory to the Islamic-leaning Justice and Development Party (AKP) of former Istanbul mayor Recep Tayyip Erdogan Sunday, in a move certain to cause jitters in the West and Israel over this strategic country's future direction. One western diplomat in Ankara termed the results nothing less than "a political earthquake." Although Erdogan ... has vowed to maintain Turkey's western orientation, observers are concerned the moderate image will give way in time to an attempt to steer this country of 68 million people along a decidedly Islamic path. The AKP was one of two parties built on the ashes of Erbakan's Welfare Party. "Turkey is a linchpin in Israel's outer rim strategy, whereby it fosters close ties with non-Arab countries on its periphery in order to counter the hostility of the Arab countries in its inner rim. The two countries have close defense, intelligence, and commercial ties ... There was speculation earlier in the day, before the scope of the AKP's victory become clear, that Erdogan would choose to form a coalition government, so as not to be seen as threatening the powerful military, the guardian of Turkey's secular legacy. The military nudged former prime minister Erbakan out of power in 1997, feeling he was charting an Islamic course for the country. The widespread feeling in Turkey today is that the military would not hesitate to act again if it felt the country's secular character was at risk. There have been three military coups in the last 40 years. "However, the sheer scope of the victory Erdogan nearly doubled the tally of the CHP sent a strong message of the voters' will, one western diplomatic official said. "In this situation, he has no incentive to compromise." Turkey is not only a linchpin in Israel's "outer rim strategy", she is a linchpin in America's strategy for the entire Middle East region. In fact, Turkish special forces soldiers are already reported to be operating in Iraq, with U.S. Special Forces leadership. These Turkish forces have actually seen combat against Iraqi forces, thus actively pitting Turkey against Iraq, and spilling blood on both sides. The Turkish military is actively secular, as this Jerusalem Post article reports; and, they have acted in the past to overthrow governments who have steered too closely to the militant Islamic path. Even though the assumption is that the military will react in exactly the same way here; however, no military can withstand immense public pressure, and the scope of this militant Islamic victory has to be clearly worrisome to Turkish military leaders. U.S. strategy to attack Iraq is built solidly on active Turkish participation, both in terms of manpower on the ground and in terms of using their airfields. A loss of this airfield might cause us to rethink our plans to attack Iraq. Already, loss of the use of Arab airfields is apparently forcing U.S. leaders to depend upon our carrier fleet to provide the necessary airpower to attack Iraq. Thus, we have seen reports that we are planning to concentrate 4 to 6 carrier groups in the Persian Gulf, instead of maintaining the age-old strategy of dispersing our naval assets as widely as possible. We have analyzed the possible disastrous effects of this strategy in NEWS1721; if you have not read this article, we encourage you to stop now and do so. Almost immediately, the leaders of the new, more militant Islamic party issued calls for Turkey not to participate in the U.S. led invasion of Iraq. NEWS BRIEF: "Turkish Party Opposes U.S. Strikes", by Zaynep Alemdar, NewsDay.com, November 4, 2002. "ANKARA, Turkey -- The leader of the winning party in Turkey's elections said Monday he is opposed to a U.S. military strike against neighboring Iraq, unless approved by the United Nations. 'We do not want war, blood, tears and dead in our region,' said Recep Tayyip Erdogan, the leader of the Justice and Development Party, which has Islamic roots. During a victory celebration at the party's headquarters, he said Turkey was 'obliged by the United Nations' decisions' ... Turkey's cooperation is crucial to any operation against Iraq. About 1,700 U.S. military forces are stationed in Turkey. Most are at Incirlik Air Base, where U.S. and British planes patrolling Iraq's northern 'no-fly' zone are based. Incirlik was also a staging point for attacks on Iraq during the Gulf War. Erdogan's statement was similar to other Turkish leaders' opposition to a strike against Iraq. Turkey fears a war would destabilize the region and harm Turkey's frail economy." Turkey's secular military leadership is now under full notice that the majority of the Turkish citizenry is opposed to their pro-Western, pro-NATO policies. Should the U.S. initiate an attack on Iraq, and should Turkey's military fully support this attack, a powerful "tsunami wave" of political protest could engulf the entire country and cause the Turkish military to withdraw support and possibly radically change their policies. However this ultimately plays out, Islamic militants have put the entire region on notice that they are a force with which to be reckoned, and they oppose Turkey's current policies. For years now, we have been boldly stating that events had to occur that would overthrow Turkey's current pro-Western policies, a radical change that would swing Turkey solidly behind the policies of radical Islam. Not only would Turkey be expected to change her pro-NATO and pro-U.S. policies, she would also change her pro-Israel policy. She would no longer cooperate in defense and economic matters; she would no longer actively support American and Israeli policies in the region. This election is a huge victory for militant Islam. But, Russia is more than interested in effecting a radical change in Turkey's present government. Russia cannot march into Iran, Syria, or Iraq without marching first through Georgia and then Turkey. Since Georgia is controlled by old New World Order Illuminist Sheverdnaza, who was in the Cabinet with Mikhail Gorbachev, Russia can count on Georgia allowing its troops to pass through on the way to the Middle East. However, Turkey is a very different story, as its government is decidedly pro-Western and anti-Russian. In fact, Turkey is a NATO member, and as such is supposedly the recipient of instant NATO military help in the event of an attack. Turkey is also fighting a fierce internal battle against Islamic extremists; at one point, several years ago, Turkey was considered a very shaky regime, one that might actually topple to the Islamic extremists. If these extremists were to topple the government in Turkey, they would welcome a Russian force marching through Turkish territory if it were on its way to attack Israel. This is the geo-political reason Israel has been so aggressive in cultivating a relationship with Turkey, even to the point of selling its latest military arms to that nation. Israeli generals and politicians can read a map as well as anyone. Therefore, Russia would be highly interested in toppling the pro-Western government in Turkey, replacing it with an Islamic fanatical government that would closely resemble the Ayatollah regime of Iran during the 1980's. Let us now reveal the prophetic truth that Turkey will be allied with Russia when Russian leads the attack on Israel in fulfillment of Ezekiel 38-39. 2. In Ezekiel 38:13, God states that Israel's allies at the time of this invasion do not aggressively move to protect Israel. Rather, they meekly issue a diplomatic note saying, "Have you gathered your hosts to take your prey? To carry away livestock and goods, to take a great spoil?" In other words, these allies of Israel will refuse to actually come to Israel's aid. At this time, Israel will feel the most betrayed she has ever felt in her life; furthermore, if the United States refuses to come to her aid, her military defeat at the hands of the Russians will seem most imminent, inevitable, and palpable. Modern scholars have noted that the United States has historically backed Israel against Russia on several occasions since Israel's national rebirth in 1948. In fact, President Nixon ordered American nuclear forces on full alert in the 1973 Middle East war, when Russia was threatening to go to nuclear, and had actually placed her atomic forces on alert. 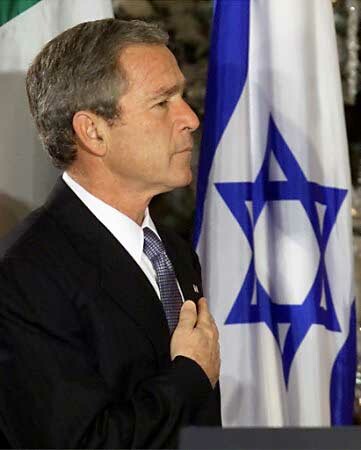 As you can see from this picture, President George W. Bush obviously staged a "photo-op" showing him in front of the Israeli Illuminist hexagram flag (Read NEWS2128 for full details]. American leaders have always supported Israel, no matter what the rest of the world thought of us. Therefore, in this instance, modern scholars ask, where is the United States here? She is still dominated by Jewish leaders in our Cabinet, and Jews are still very influential in elections in several key states like New York. Even given the preference Liberal Democrates have shown for all things Arab, it is not conceivable that he could allow a steadily-marching huge army coming at Israel from the North and the South without moving to protect Israel. HOW DOES RUSSIA NEUTRALIZE TURKEY, CAUSING HER TO CHANGE TO ISLAMIC FANATICAL GOVERNMENT THAT WILL INVITE RUSSIA TO CROSS HER TERRITORY? The most obviously simple plan would be to foment such a terrible Islamic revolution within Turkey that the pro-Western, pro-Israeli government would be overwhelmed. This scenario would prevent Russia from attacking Turkey from without, thus triggering a NATO response. Russia has been aiding the Islamic Fundamentalists for years, nearly toppling the Turkish government several years ago. What events might so outrage Turkish Arabs so greatly that they would unite as never before and cause such havoc as to overthrow the current government? 1. If the United States initiates an attack on Iraq, with Turkish military support, the militant Muslim population might arise as one to overwhelm the capability of the Turkish military to calm the situation, especially if professional Russian agents were on the scene, providing key leadership to the civilian protestors. Since many of the soldiers within the Turkish military are undoubtedly supportive of the militant Muslim position, they might refuse to carry out orders against the civilian protesters. The Illuminati has always feared a generally aroused population, and goes to great lengths to disguise what they are doing so as to not provoke a huge civilian backlash. This civilian backlash would be the more severe if Iraqi missiles actually struck Turkish targets. 2. I think the bombing of the Dome of the Rock would be exactly the kind of unifying event that would cause all groups of Turks to unite to overthrow their present government. When the Palestinians bomb the Dome of the Rock [Read NEWS1404 for full details] and blame it on the Israelis, the entire Arab and Islamic world will explode as one! No Arab will ever believe the destruction of this 1,400-year-old shrine did NOT happen by Jewish hand, and certainly no Arab will ever believe the Palestinians blew it up in order to instantly unite all of the Arab world like never before. And it will unite the entire Arab world. One of the major problems facing Islamic Fundamentalists in their genocidal campaign against Israel is that they can never be united. Most of the Arab governments in the Middle East have been moderate to liberal, not Fundamental Islamic. Therefore, most governments have repressed fanatical Islamic extremists to one degree or another. When the Dome of the Rock blows up, however, the dynamic forces throughout the entire Arab world change instantly! For the first time ever, since Israel became a nation in 1948, the fanatic Islamic fundamentalist will command the loyalty and fervent passions of every Arab in the world. Even moderate Arabs will be radicalized, to the point of fervently following the goals of the Fundamentalist Islamic leaders. Every moderate to liberal Arab government will instantly be under attack, and my guess is that every one of them will fall to the hatreds and passions of the fanatics. I would believe that, suddenly, every Arab government in the world will be fervently anti-Israel and will gladly join in the "Jihad", holy war. Thus, the current governments of Jordan, Egypt, Saudi Arabia, Kuwait, and Turkey will come under the greatest attack of their history, and will probably fall to the extremists. Israel will suddenly find her agreements with Egypt and Jordan to be null and void. She will discover that the Arab extremists in Turkey have not only toppled the current government, but have possession of every piece of military equipment Israel has ever sold her. This kind of Islamic uprising is precisely what the Palestinians, under the leadership of Arafat, is counting upon. They believe that the entire Arab world will never unite as one against Israel unless something like this event occurs. But, as we demonstrate in NEWS1404, the bombing of the Dome of the Rock is really an Illuminist plot. Why would the Illuminati be so interested in uniting the Arab world? This question is especially pertinent when you realize that Illuminized Jews were responsible from the beginning in 1897 in the first Zionist Conference, all the way to 1948, when Israel became a nation. 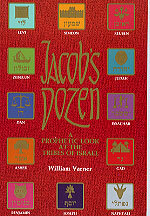 Furthermore, every single Israeli Prime Minister has been Illuminist. Why, then, would the Illuminati be so interested in fomenting the type of conflict in which a mere 6 million Jews would suddenly be pitted against one billion Arabs? Might not this type of conflagration cause the violent death of the entire nation of Israel? Yassir Arafat certainly seems to think so. But, how does the Illuminati justify deliberately creating the very event which will unite the Arab world as nothing else possibly could, and threaten the existence of a nation led by Illuminists? The answer is simple, and yet profound. The Illuminati plans the elimination of all Arabs , every single one of them, because they are fervently Monotheistic and could never accept the claims of the coming Antichrist. The Illuminati has provided Israel with atomic and neutron bombs, which Israel will certainly use in this upcoming battle. But, the Illuminati has also supplied Israel with the latest in exotic weaponry, Beam Weaponry using HAARP technology. We have noted in HAARP articles that particle-beam technology has been perfected that would allow a "death-ray" to obliterate every living thing within the prescribed area. New Age author Jerry Smith, one of the authors writing about HAARP weaponry technology, told me in an email in 1998 that American forces had experimented with this particle-beam technology in the Gulf War in 1991. Large 2 1/2 ton trucks have been outfitted with particle beam weapons. Israel has used the Oslo Peace Accords to legalize the Palestinians' enclaves within Israel and to discourage Jewish citizens from living there. Many Jewish citizens have been invited by their own government to leave, and resettle in a Jewish community. Many Jews have done just that. Hebron is a good example. When Israel turned this city over to Palestinian rule, the paper said that over 40,000 Arabs lived in Hebron, and less than 1,000 Jews. Therefore, if Israel can just get those 1,000 Jews out, they could have a clear shot of annihilating the Palestinians with particle beam weaponry. This weapon is so devastating that it will allow 6 million Jews to win a battle with one billion Arabs. Truly, God's prophecies about Israel winning against such large odds in the End of the Age are coming true today. Truly, all the prophecies about Judgment at the End of the Age against every Arab nation are coming true, and in a most unexpected manner. Watch the Dome of the Rock . When it blows up, the entire Arab world will be reunited as never before, and Islamic extremists will begin their charge against liberal or moderate Arab governments. If Turkey falls to extremists, then the prophetic scenario of Turkey joining the Russian-led invasion of Israel in fulfillment of Ezekiel 38-39 will be reality. Finally, the Illuminati is so interested in promoting the welfare of Israel at the expense of the Arabs because they fully plan to rebuild Solomon's Temple on the Temple Mount! To secure the safety and welfare of this new Masonic Temple -- Antichrist's Temple -- the Illuminati is more than willing to annihilate all Muslims. [Read NEWS1643 for full details of this Illuminist Masonic plan to rebuild Solomon's Temple]. Truly, these events demonstrate once again that we are truly at the End of the Age. This momentuous election change in Turkey might proceed along the path to where Ezekiel 38-39 prophecy would be fulfilled.